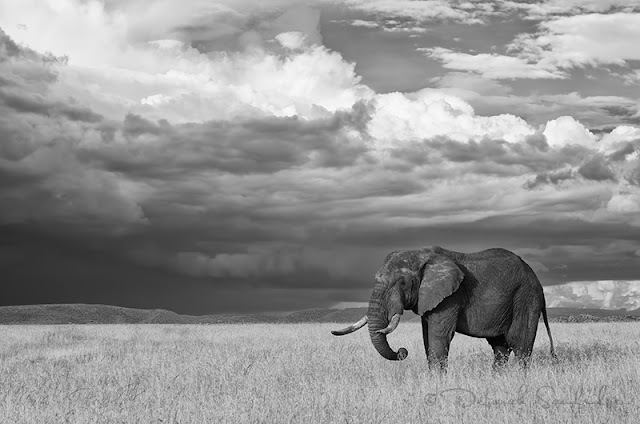 Elephant at Serengeti National Park in infrared. I'm back from several weeks of co-leading an exciting photography trip to Kenya and Tanzania! I took an infrared converted Nikon D7000 modified with an R72 type filter to be able to photograph animals, landscapes and people. With the elephant image above, a storm rolling in adding to the overall drama of the image. I used a Nikon 24-70mm lens with Live View to focus (which gives flexibility on the use of lenses while photographing in infrared). Infrared conversion by Digital Silver Imaging.